Every day, millions of people in the United States use elevators and escalators to quickly and effortlessly navigate multi-floor structures such as shopping malls, office buildings, airports, hospitals, apartment buildings, and condominiums. People who take advantage of these machines have a right to assume that they will function safely. Unfortunately, that is not always the case. Thousands of people are injured—or even killed—in elevator and escalator accidents each year. In fact, elevators alone injure approximately 10,200 people and kill 27 people annually, according to the U.S. Bureau of Labor Statistics and the Consumer Product Safety Commission (CPSC). The injuries sustained in accidents caused by defective, malfunctioning, or poorly maintained elevators and escalators can be significant, require expensive medical treatment and potentially result in long-term pain and suffering. Fortunately, financial compensation may be available for the victims of such accidents. If you were injured in an elevator or escalator accident, here's what you should know before taking legal action. Elevator and escalator accidents can be caused by any number of factors, but underlying issues that can lead to such incidents include design or manufacturing defects, overcrowding or overloading, electrical or mechanical malfunctions, and inadequate maintenance. Malfunctioning elevator door sensors that cause the doors to open or close prematurely. Pulley system or mechanical malfunctions that cause the elevator car to fall suddenly or fail to align with the floor properly. A missing elevator car that results in open shaft accidents. Faulty wiring or control malfunctions that can lead to fire, electrocutions or entrapment. Improperly installed interior equipment or ceiling panels. Elevator maintenance and repairs completed by unqualified individuals. Clothing, shoelaces, hair, or fingers caught in the escalator's moving parts. Missing or broken escalator steps. Broken or missing “teeth” on the escalator's track. Excessive space between the escalator's steps and sides. Damaged or poorly designed handrails. Lack of regular inspections and maintenance. Before personal injury plaintiffs can file a lawsuit seeking compensation for injuries sustained in an elevator or escalator accident, they must first determine whom to name as a defendant. 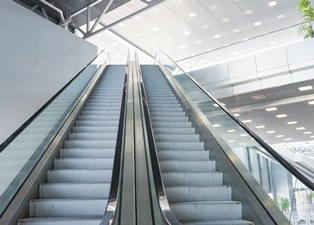 However, determining liability in elevator and escalator accident cases can be difficult and depends primarily on the incident's underlying cause. For example, if the accident was caused by a design or manufacturing defect, the manufacturer or distributor may be considered liable. If the property owner failed to properly maintain the elevator or escalator, they might be responsible. A personal injury attorney with experience handling product liability and premises liability cases will examine the case in detail to help their client determine the appropriate party to name in the lawsuit. People who were injured in elevator and escalator accidents who file personal injury lawsuits can seek compensation for economic and non-economic damages. Economic damages include past and future accident-related medical expenses, repair or replacement costs for property damaged in the accident and wages lost while recovering from injuries sustained in the accident. Non-economic damages include compensation for physical pain and suffering, emotional anguish, and other things that have no direct monetary value. If you were injured in an elevator or escalator accident, having an experienced attorney who can look out for your interests is invaluable. Let the skilled premises liability attorneys with the Morris James Personal Injury Group help you fight for the compensation you deserve. Contact the Morris James Personal Injury Group today to schedule a free, no-obligation case analysis.